April showers bring May flowers right? Spring is here and many of us are spending our days outside either gardening, or running around with the kids. I love this time of year! 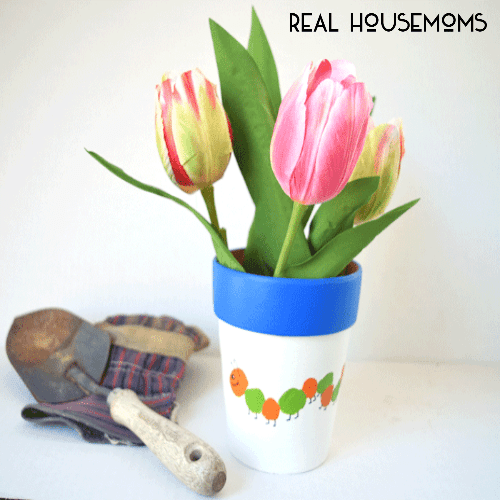 This is a great time to spend a little time crafting with our kids, sto ring in the spring, I decided to have him help me decorate a flower pot with a little paint! If your child doesn’t have the attention span to sit and craft for too long (like mine), then this is the perfect project! 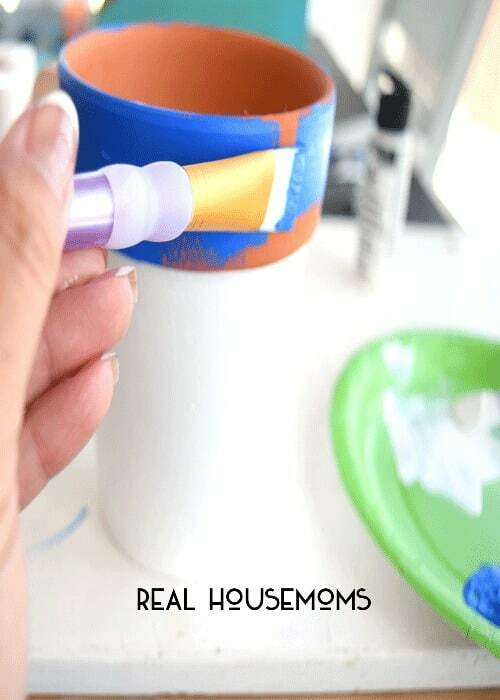 Start by adding a couple quick coats of paint onto the flower pot; I chose bright white for the body of the pot, and a cobalt blue for the rim. 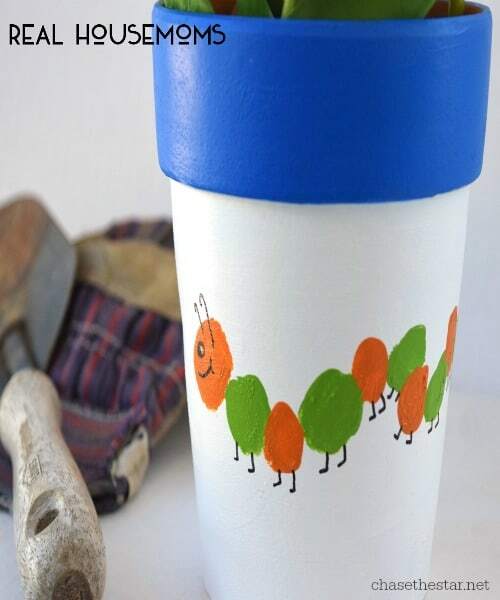 Next, have your child dip their thumb in one color of paint, and create the ‘head’ of the caterpillar. Using alternating colors, repeat the process, creating the ‘body’ of the caterpillar. You may need to draw a little guide on the pot with a pencil so they know where to place their little fingers. Lastly, once the paint is dry, add little ‘legs’ and even an antenna and eyes, or whatever you like to the caterpillar. 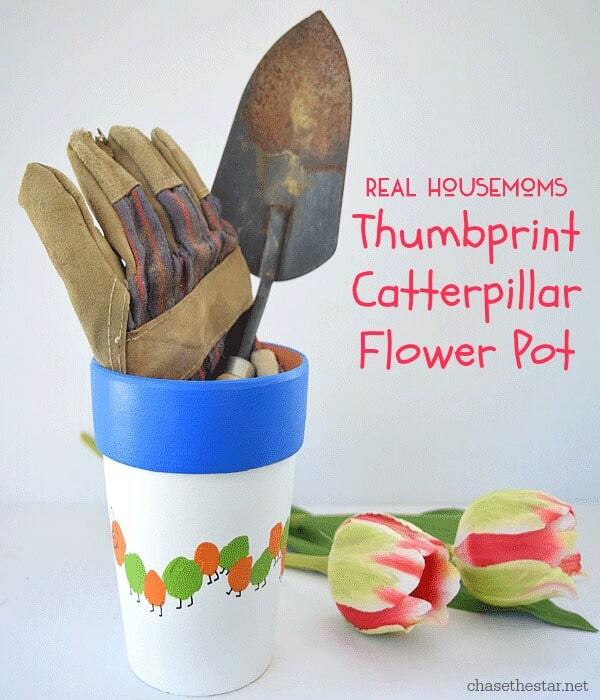 In all of about 5 minutes your child can help create a really cute flower pot to help celebrate spring! As my son gets older he wants to spend less time coloring and painting, and more time outside with his friends and his video games. I cherish these moments with him but I am well aware that they won’t be around forever, so if a 5 minute craft is all I can get out of him, I will take it! If your child still loves to craft (lucky you!) 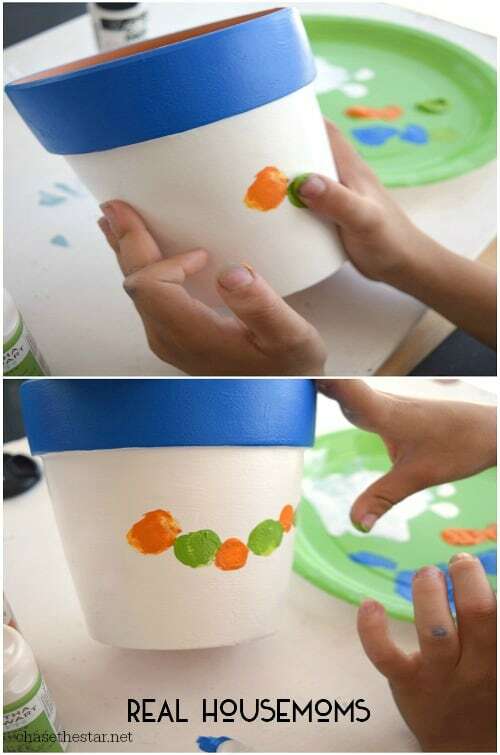 then have them paint the pot, add the caterpillar feet on their own, or give them free rein to be as creative as they want! There are so many simple ways to get creative in the springtime! How do you ring in the spring? What a cute idea, I love it. This will be great with the kids.